I first heard Jacob Dicker play when I was judging in Ontario a couple of years ago. He struck me as being a very fine amateur player, one to watch, as they say. I didn’t get to hear him again until May of 2005 and I should have been watching! He gave a performance that could easily have won the William Livingstone Sr. Memorial Invitational Competition in Hamilton. In fact, he was in a tied position for the championship, which went, on piobaireachd preference, to Andy Rogers of Fredericton, New Brunswick. I had an opportunity to speak to Jacob and his parents before I left and we arranged to do an on-line interview to prepare this article. Jacob was born in 1988 to Lloyd and Donna Dicker. "My family is Scottish/English," he says. "My dad's parents moved over to Canada from Scotland after WWII, but my mother's side has been over here considerably longer. I have one younger sister Kathleen and she is a Highland dancer. My piping comes mainly from my parents and extended family. My dad, two uncles and one cousin also play the pipes. I also have an aunt who plays snare, and another cousin who is a tenor drummer." 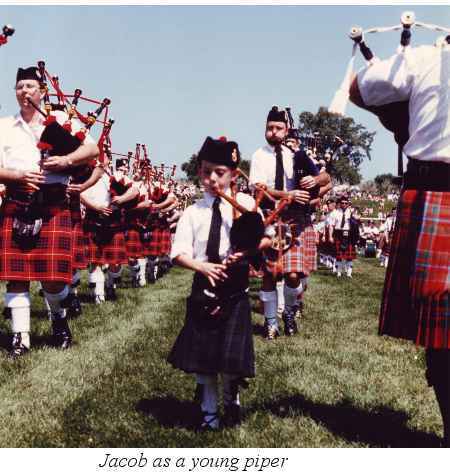 Jacob began learning to play the chanter when he was five years old. "What actually triggered my interest is hazy, but I am assuming it would have been hearing my dad playing around the house that caught my attention. My first teacher was Tom Rankin, pipe major of the Sarnia Legion Pipe Band, who taught me the basic movements and many of the standard tunes. The lessons he gave me were in a group setting. I continued to take lessons from him until my Grade 4 solo year. In the beginning, I also received instruction from my uncle Terry and cousin Adam. "Later, I began taking lessons from Bill McLeod of Kincardine, Ontario. He helped me improve my technique and it was while I was with him that I tied for first place in the Ontario Champion Supreme standings for Grade 4. It was my first year in the grade, and I won it for Grade 3 in my first year there as well." After Jacob moved up to Grade 2, he began talking lessons from Willie Connell of London, Ontario. "I started learning piobaireachd from Willie," says Jacob. "I took the first place prize in my first piobaireachd contest just four months after my first piobaireachd lesson. That contest was the last of the year, so I played in the novice piobaireachd grade the next year too, winning every contest except one." Jacob moved out of Grade 2 the next year, having won the overall championship for the season. 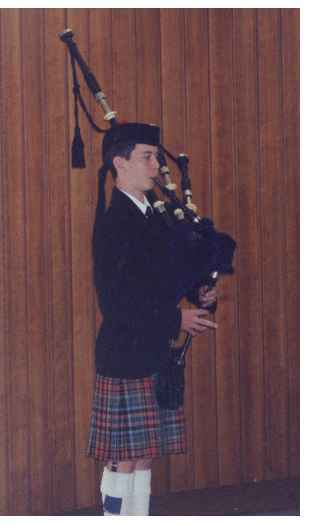 During his one and only year in Grade 1, he was named the Amateur Piper of the Day at 7 out of 10 contests to win the overall championship in piobaireachd and placed 2nd overall in the light music. 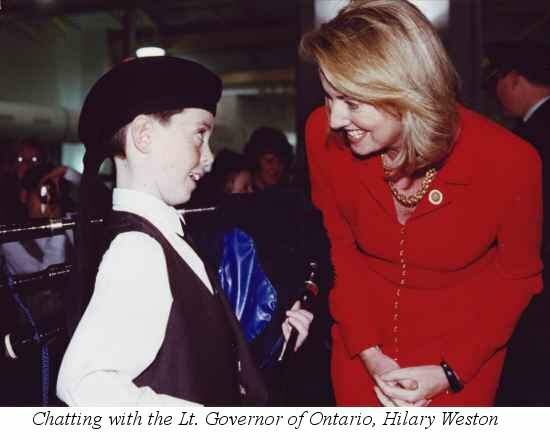 In October of 2003, he represented Ontario in the Nicol-Brown Contest in Albany, NY and placed 2nd overall. "During my amateur career," says Jacob, "I won the Ontario Champion Supreme Award eight times – in grades 5,4,3 and 2 in the Light Music events and in the Novice, Intermediate and Senior Piobaireachd. I skipped junior," he adds. When he did not win the overall, he placed 2nd. "My professional career began in 2004," Jacob continues. "During that year I placed third at the Gold Medal Light Music contest in Maxville and was runner up for Piper of the Day twice. In the overall standings for that year, I tied for second in the piobaireachd. In May 2005 I competed at the Livingstone Invitational where I placed 2nd overall, taking 3rd in the March, Strathspey, Reel, Hornpipe and Jig event and 2nd in the Piobaireachd. That was probably my most important competitive accomplishment to date. My most memorable moments, though, have been winning my first piobaireachd contest and the Nicol-Brown contests." Jacob plays a 1928 set of Henderson’s that were given to him by a friend of the family. "They were just sitting in his basement," Jacob explains his good fortune. "Currently I play with the Grade 2 Windsor Police Pipe Band. I have been with them since 2001. Before that, I played with Lambton Scottish Pipe Band and the St. Thomas Police Pipe Band, both in Grade 4. I first competed in a band contest when I was 8 years old." Jacob does not currently teach piping, but he has helped with beginners at band practices in the past. "It was generally a positive experience," he says, "but unfortunately I am not the most patient person there is so I found it to be frustrating at times." A professional piper at the age of sixteen, it was only natural that to ask Jacob if he could give other aspiring young players any advice. "Whether you have had a good or a bad competition result," he says, "always look for something to build on, and never be too hard on yourself if the results aren't in your favour."